EXTRA, EXTRA, Read All About it... $1.2 billion of Haiti's debt was cancelled yesterday, June 30 2009, by three international organizations. Haiti is now debt free! Nearly two-thirds of Haiti's huge debt has been cancelled [Sa Vle di nou pa dwe]. As of April, Haiti owned more than $1.9 billion. Go ahead... Jump for joy!!! That's good news for Haiti Cherie! Millions of dollars, each year, has been freed for the Haitian Government to use to improve Haiti. Can you imagine what the interest is on $1.2 Billion? I don't want to know and I am sure President Preval doesn't want to know neither. We don't have to pay it anymore!!! If you are a concerned Haitian citizen like me I am sure you are happy to hear this great news. « Trinidad And Tobago, That's where I am going Next! This is Joanne Buell from Esperanza. Please contact me when you get this. I need to speak to you. Hoping this note finds you well. I just hope that we take this amazing gift, which is debt-forgiveness, and do something productive. 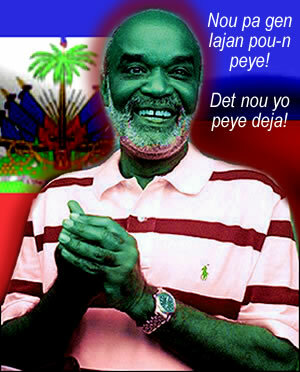 Haiti needs a serious shake-up and shape-up of ther finances. in the name of Haiti, million thanks to world bank. Ex president Aristide and his gorvernment include the senate burried Haiti for their own interets.now, God want to revive this country again. to be at the level of countries I wish the internal distroys all the people served in Aristide gorvernment, include all politic leaders and restart the country with a new generation; if not, Haiti will be durty again. Il faut que le gouvernement de madame Pierre-LOUIS fasse une déclaration à la nation à l'assemblée nationale sur la position réelle du compte de l'état après cette annulement d'une partie de la dette.